In many embroidery shops one of the largest (and most controllable) expenses is product damaged in the production cycle. Many times the mistakes that kill a product happen long before the product ever touches an embroidery machine. Many times those blunders can be traced to a simple paperwork error. Commercial embroidery is a detail oriented business and superior record keeping practices are vital to maintaining your bottom line. As your business grows you will quickly find that storing and managing your embroidery files becomes a major challenge. You will need a method to effectively store, search and retrieve your design files with color sequence and other important meta data for the design. There are many “old fashioned” ways to achieve this but this is one area where your personal computer can be your best friend. There are software products you can purchase to catalog your files. But you may find each program lacks something you would want to include. Think of the times when you have used a program and thought to yourself, “I really wish my program would do …” With only basic computer skills and one afternoon you can use very affordable database software like FileMaker Pro to create your own custom database solution. It is beyond the scope of this article to teach you how to be a database programmer however, basic databases are easy to design and program. With minimal effort you can create fully functional and very powerful database. I will make available (free) by email request (see below) the database used to illustrate this article. However, if you want something more sophisticated and you are committed to learning a new discipline you are limited only by your imagination. One quick note, this article assumes you store your designs in an easy to retrieve location like a well backed up computer hard drive or any type of well managed digital media storage solution. Any database you create (or use) must have the ability to store all of the data that is important to you. You must also be able to easily search the database, retrieve the information you need and when necessary print your important documents. The actual embroidery file is be saved by the design number and never by the design name. An information field where you can enter notes about the pattern. Key word field – used for wild card searches but only effective if “populated” by user. One of the most important aspect of your database is the ability to search by any field in the database using a full word or even a partial word. Vague searches should return multiple designs and specific searches should return only result. 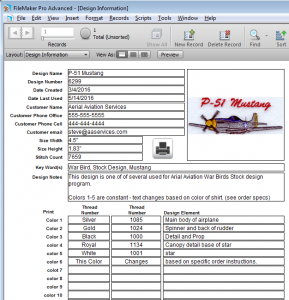 For example, you are an embroider who has clients in the aviation industry and you decorate many shirts with airplane designs but today you need the P-51 Mustang design. You should be able to “query” the Design Name field in your database to search for, “P-5”. The database will return only designs with P-5 in the design name. 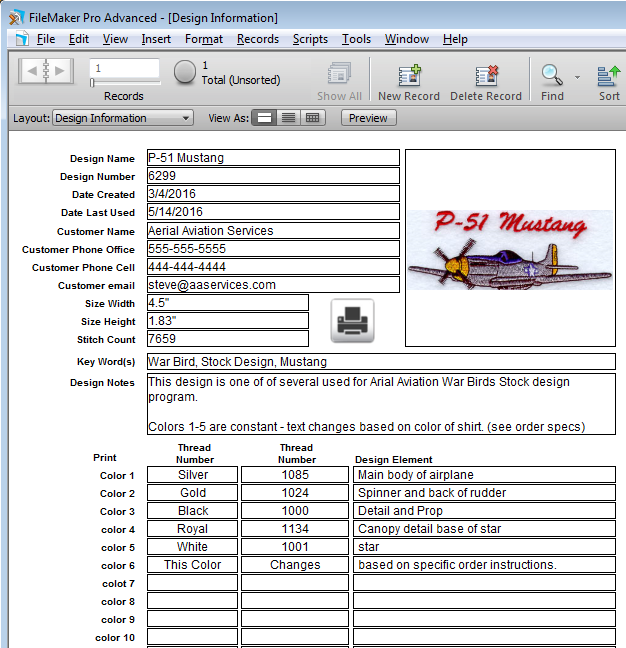 Of course you can be more specific and search by “P-51.” In that case your database will only return designs with P-51 in the design name. Once you locate the design you need you would then simply transfer the design (by design number) from your storage media to something like a floppy disk, thumb drive, flash drive, LAN connection, etc. so you can load the design to your embroidery machine. The entire process should take you no more than a couple of seconds. Virtually instant access to any design in your entire design library. The beauty of doing this yourself over purchasing a pre-programmed system is you can design the database with your exact requirements. The database available (by email) took less than 10 minutes to create. While this database is limited in fancy functions there is no reason you could not use this to store millions of design records and instantly recall the details for any design. With very modest changes you can create a similar database that will maintain all of your production records; that way, when XYZ Customer tells you to embroider it, “just like last time” you can instantly recall exactly what “last time” was and complete the re-order without difficulty. Aside from the pile of money you can save by being more efficient and accurate you present yourself as the consummate professional. Your queries are only limited by your imagination. For example, you can easily search by customer name (or portion of a customer name) and return all designs for only that customer. By doing a slightly more sophisticated search you can search by customer name and date range. That might not seem important but how many times have you tried to find a design for someone and the only information you have is their name “XYZ Customer” and you know you did the logo a few months ago. You could search this (or any well programmed) database by “XYZ customer” between Date Created “1/1/16…6/1/16” and the database would return all of the designs for XYZ between the start of the year and June first. Then all you have to do is tab through a few records to find the right logo. In our digital age how you manage data is a vital function of your business. In a world where time is money and preventing production errors can be the difference between paying yourself this month (or not) how you manage your design information is a critical function of your embroidery business. Remember; if you would like a free, 100% functional version of the design information database used to illustrate this article just send an email to steve.freeman@qdigitizing.com. I love the idea of a database. Thank you for writing this article. It offers me an option I hadn’t thought of before. Sure beats the notebook I’ve kept this past year.